1. 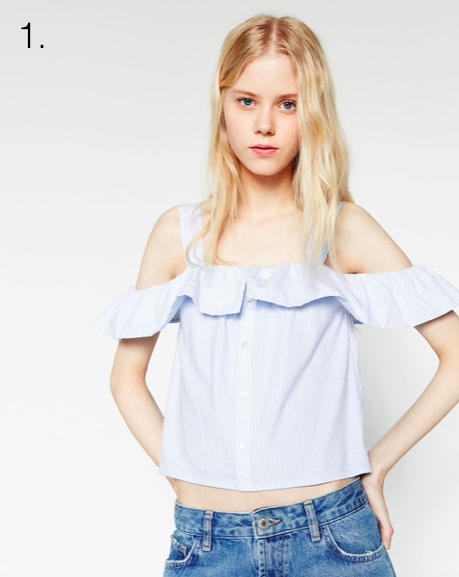 Frilled Top - I mentioned this Zara top in a recent Cold Shoulder post and my love for it has tripled since then. It is incredibly comfortable, incredibly fashionable, and super flirty. When I put this top on I feel young and fun (I typically feel tired and mom-ish). So, yes please! 2. Clutch - I received this clutch for my birthday last year and haven't been able to use it as often as I would like now that the diaper bag is my current "go to" accessory. I took it with me on our trip to Italy and it was perfect! It took up literally no room in my suitcase and is the perfect size for my ID, phone, and lipstick. 3. Suitcase - I have two sizes of this Delsey spinner bag and I am crazy about both of them. I was never a hard-sided suitcase fan but the quality and detail of these bags took my hesitation away immediately. This little love was MIA for a few days, and I was panicked. The airline lost my bag (of course not Phil's) on our flight home from Italy. Luckily, after a few days they located it and it was delivered safe and sound to our home. Thank goodness! 4. Sandals - These sandals are a result of my lost suitcase. I took every sandal I owned to Italy so when my bag went missing on our trip home my closet was full of heels and boots, neither a great option for 80 degree walks to the park. I picked these up at Target and LOVE them! They are so comfortable, and their black and white design goes with everything. 5. Choker - With chokers being all the rage, I of course had to jump on the band wagon. I snagged this choker from Aldo before our trip and soon realized I could wear it with pretty much everything I own. You can wrap the choker as few or as many times around your neck as you like, adding to its neutral versatility. 6. Book - I ordered this Chelsea Handler book last minute (thank you Amazon Prime) for the LONG flight to Italy. I am not a Chelsea Handler fan but I have read ALL of her books. Her stand up and TV shows don't do it for me but her books literally bring me to tears. Her unapologetic attitude and outrageous ideas are so refreshing. If you're looking for a light read with lots of laughs - this is a great summer book!